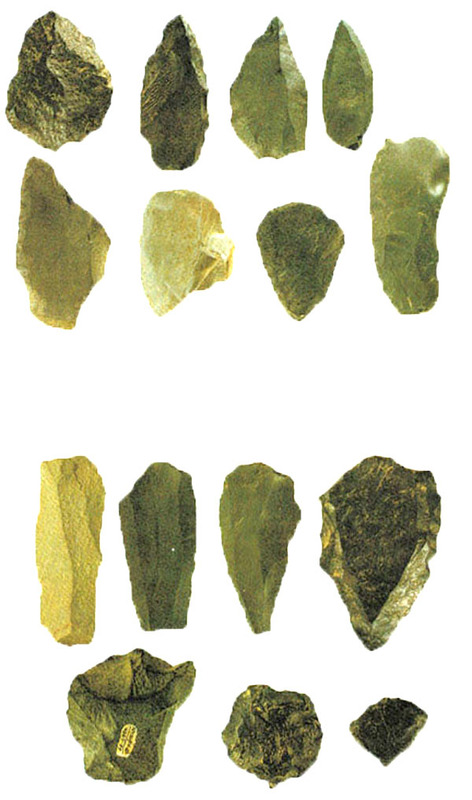 The Palaeolithic Era - Samples of tools from the Palaeolithic period have been found in the proximity of the small river Ulalinka near Gorno-Altaisk. It claims to be an old stone tool of prehistoric human beings and could be dated back to the Sartan-Ice Age (during the last glaciation some 24,000 to 12,000 years ago). There were also found milled stones at the shores of the Seja River, a tributary to the river Amur, which are older than the Sinanthropus (Peking Man) from the Zhoukoudian cave (Chou Kou Tien) discovered in China (some 680,000  780,000 years ago). Those were polyhedrons that had been developed (manufactured) by the ancient humans. These were massive debris, mostly river debris, from which sharp edges were cut off, thus forming a sharp working edge. The oldest samples of a hand  axe made by humans in the Early Stone Age (which are comparable with the African Old Palaeolithic Period) are estimated to be 2,6 million years old. 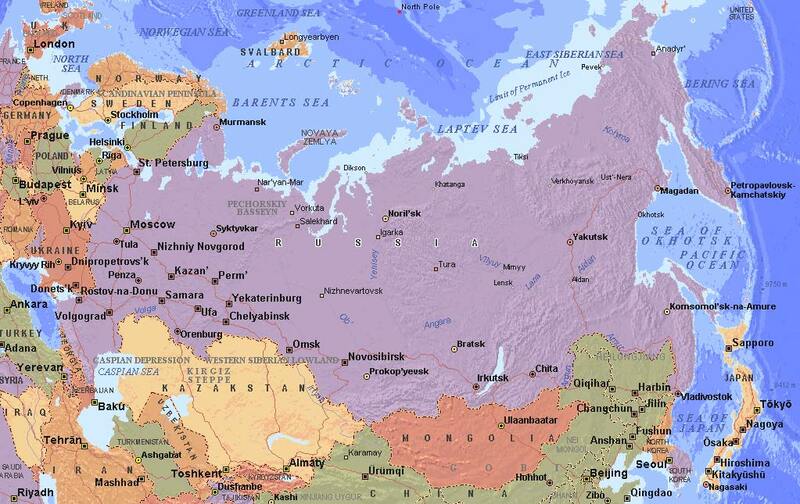 There is a possibility that this kind of technique was brought to Siberia from Africa through Europe and the Middle East during the West-East Migration, in the time of Glacial Period (the second youngest Ice Age  with glaciers reaching as far as the foothills of the Alps). Acheulean is an archaeological industry of stone tool manufacture characterized by distinctive oval and pear-shaped "hand-axes", which was made 1,7 million years B. C. and lasted up until 150.000 years) and is associated with early humans. These findings may be associated with the cultural epoch of early human beings. 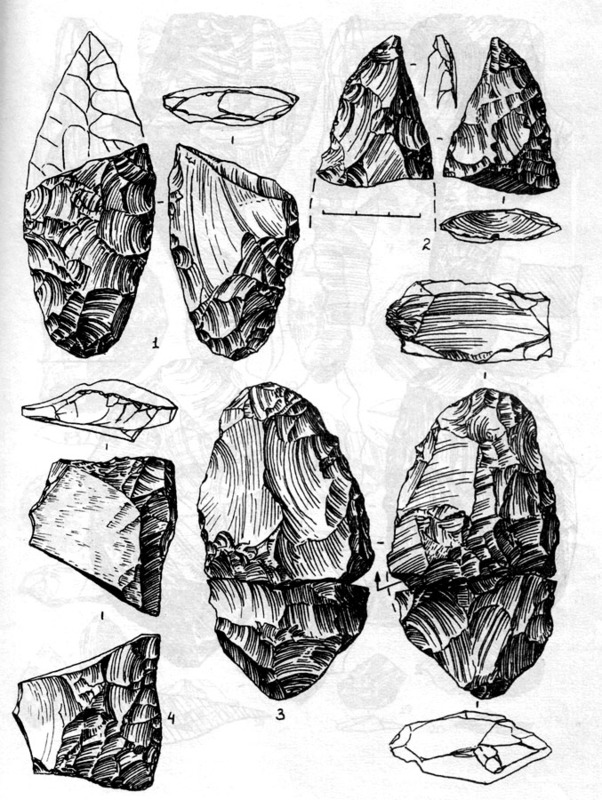 These finding lead to the assumption that there were also produced tools using these techniques also in Africa, in Europe, in Eurasia and India. Carved stones, which had undergone different technical processes, have been found all along the Amur in Usha Kurnari, Fimoschki and Ust-Tu, also along the river Ulainka in Altai and in Eastern Mongolia, in the west of the town of Sayn Schand (East Gobi Aimag); these tools had been produced using different techniques. The conclusion is that the Siberian territory had not been massively populated at that time, but in smaller groups with their own cultural heritage  that means that a developed East-Asian technology had dominated over Acheulean. Nevertheless, the last ones have been found at the river Ulalinka and in Kizil-Osek. 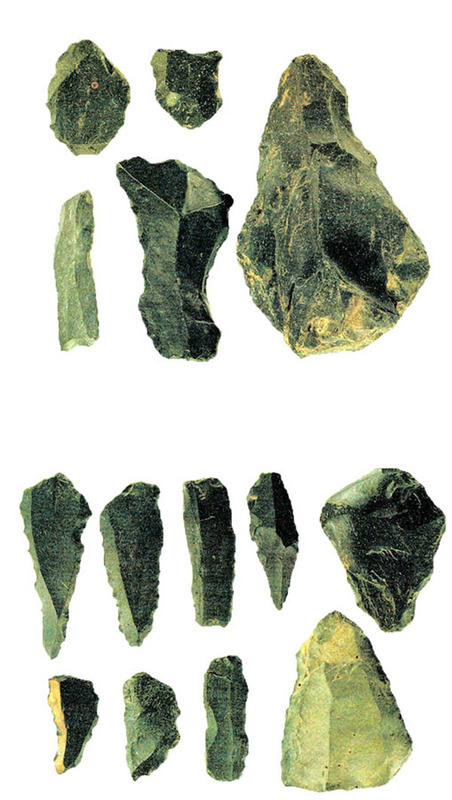 Likewise, chopping tools were present in the Altai region, this means in lower Palaeolithic stage (early Stone Age) but also used a long time later in the Later Palaeolithic stage. In later periods came black flint stone. The flint stone was very important as a raw material for making tools and weapons, especially because of its great hardness and the possibility to be easily split and its sharp cutting edges. In the Primoje region, in the village Ossinowka, almost 40 km from Ussurijsk there have been made very important findings. That region is situated in the uttermost south-east of Russia at the Sea of Japan and on the frontiers of China and North Korea. There were found indicators of utilization of the place for “production”, which was then used and populated over several generations. Layers under the earlier Ice Age could belong to the Mohe culture that have been found as excavation from the Neolithic period (Young Stone Age) and the Mesolithic period (Middle Stone Age). At the settlement Ustinowka at the Taduscha River there have been found tuff deposits with tools for manufacturing stone as well as anvil and core stone  which indicates that the people of that time had known industrial production of tools. Tuff or “tuff stone” are volcanic eruptions that have solidified. Young Stone Age  A great part of Siberia has already been populated since the Neolithic period (The Young Stone Age  beginning of livestock keeping and farming). Research has revealed that there was a connection with large forest areas in Eastern Europe. In a very early stage the people from South Siberia had created a closed cultural area, which reached from the Baikal to the Japan Isles and from Mongolia to the Pacific. Archaeological research has confirmed that the cultures preserved their independent character regarding different art crafts as well as tooling. Inhabited huts were covered with fur, in the middle there was a fireplace; there were birch barks on piles of rock stretching over deep excavations. Human settlements with up to 15 huts, where people lived from fishing, can be found in the Amur region. Other cultures existed along the coastline, like the Sidemin culture at the Amur, and the Uril culture in the Altai. There have also been found tools from the 9th millennium B. C. as well as glossy red amphora-like vessels. There existed the Chapigon culture dated from the 2nd century B. C. and in the following the Polzomer culture near Vladivostok. In Siberia, in the Sayan mountains and the Lake Baikal, there have been found great resources of precious jewellery, as a result of the nephrite process (mixture crystals from completed series of the minerals tremolite and actinolite) and serpentine (formation of monoclinic crystal system, also crystallizes silicate mineral with chemical composition). Considering all facts, this proved one continuous and trans-regional development. Untypically, the same jewellery has been found in China, too. Findings of finished jewellery pieces were also given in the Ural and at the Volga. Knowing that, it is confirmed that there were contacts to other regions or migrations. An invasion of peoples settling in the north to the south, as far as to the Yellow River, has thus been proven. It was also discovered on the basis of findings that Iranian tribes had exerted influence in the East Pamir Mountains, as well as in the Middle Asian and Mongolian region; also in southern Siberia, nowadays Chinese, Soviet and Kazakh Altai mountains. Furthermore, there were also findings from the Karasuk culture. During the Yin-Dynasty (1) horse and vehicle were used for the first time. Tribes from the East-Siberian region pertaining to the Serow- Kitoi culture (2), (Shiwei  see map), had to be moved in 3rd to 2nd century B. C. to the Baikal region, all the way to the Yellow River, as is visible from Chinese chronicles. At the end of the Old Stone Age hunters and gatherers were present (foragers). Those were actually hunter-gatherers with their dogs accompanying them, when they wandered along and lived in tents; from these, only fireplaces were found. Later on, reindeer herders invaded the Amur region, which could be assigned to a Tungusic-Manchu language. Over time, local individual cultures transformed to or united into a widely distributed culture, which witnessed cultural expansion during its climax. These peoples were very successful having high income from agriculture, and thus they succeeded in assuming a dominant role. 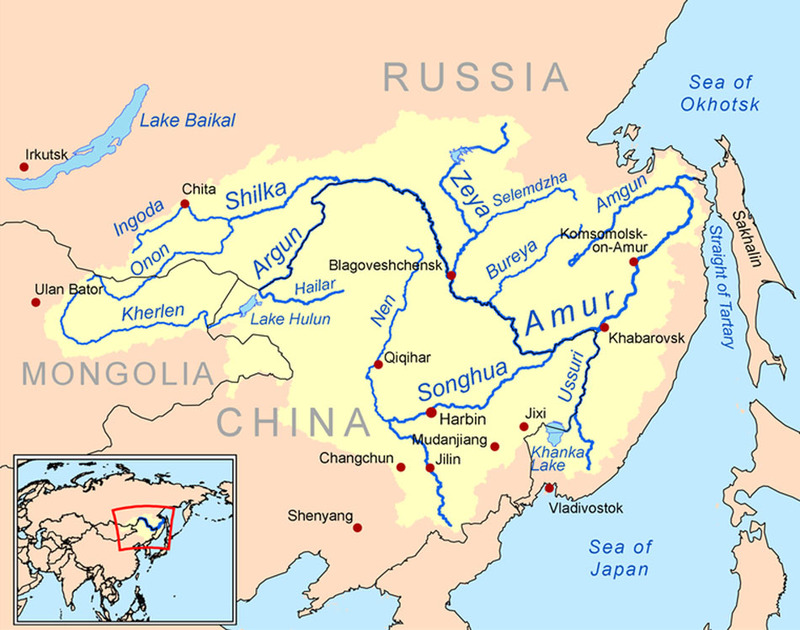 They formed tribal units and established the first realm in the Amur region, that of the Bohai (Balhae  see map) and that of Jurchen or Jurcheds (4), which was equal with the Chinese. The union of Mongolian tribes under Genghis Khan in the 12th century put an end to that higher culture. (1) Jin Dynasty (or Shang-Dynasty) - was the second dynasty in Chinese history. 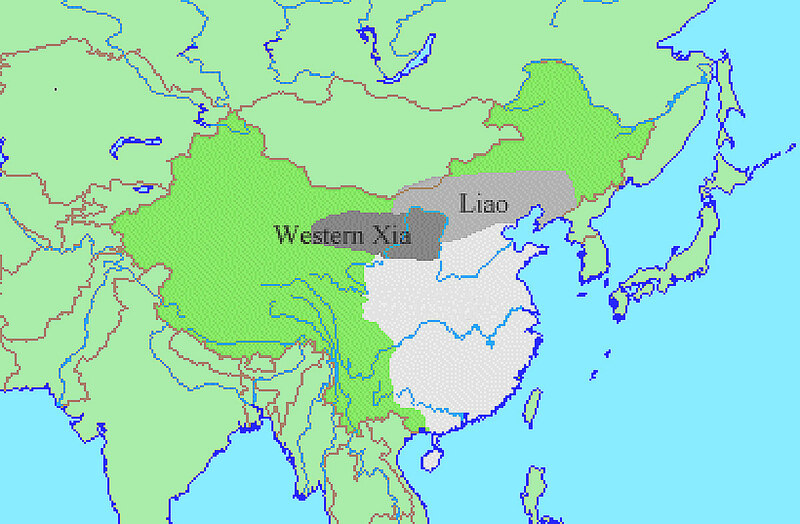 They ruled over China from the 16th century B. C. to the 11th century B. C., succeeding the Xia dynasty and followed by the Zhou dynasty. 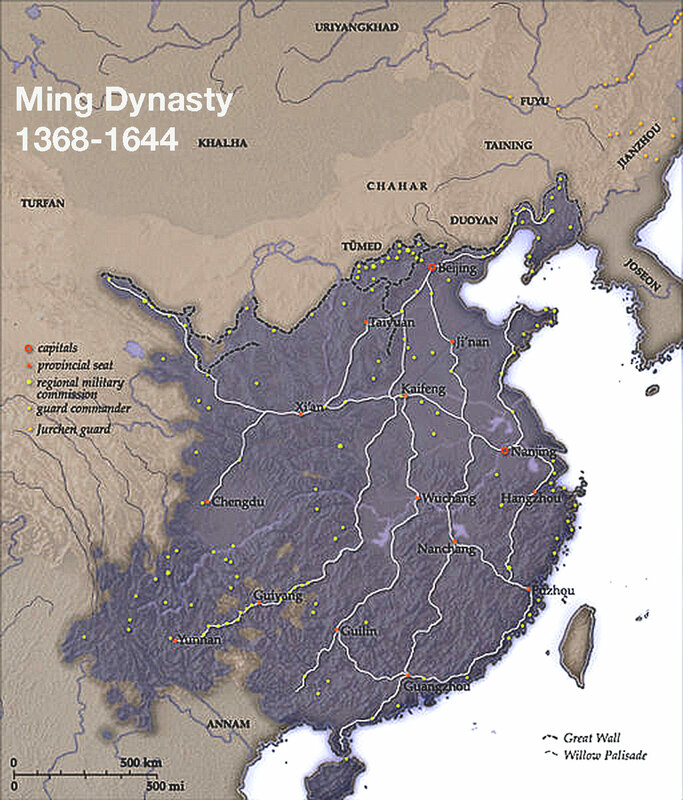 The Shang Dynasty is the first Chinese dynasty according to traditional historiography. (2) The river Kitoi had its origins in the East Sajan. It is formed by the combination of two 20 km long rivers, the Samarta and the Urda-Ulsyta. 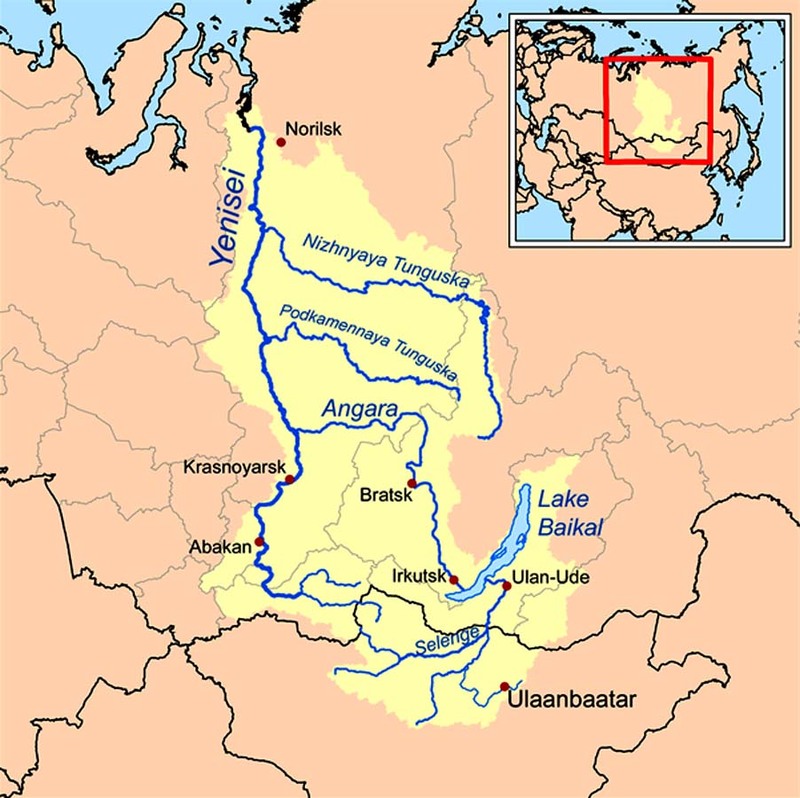 The river Kitoi flows through the mountains eastwards and terminates at Angarsk into the Angara. 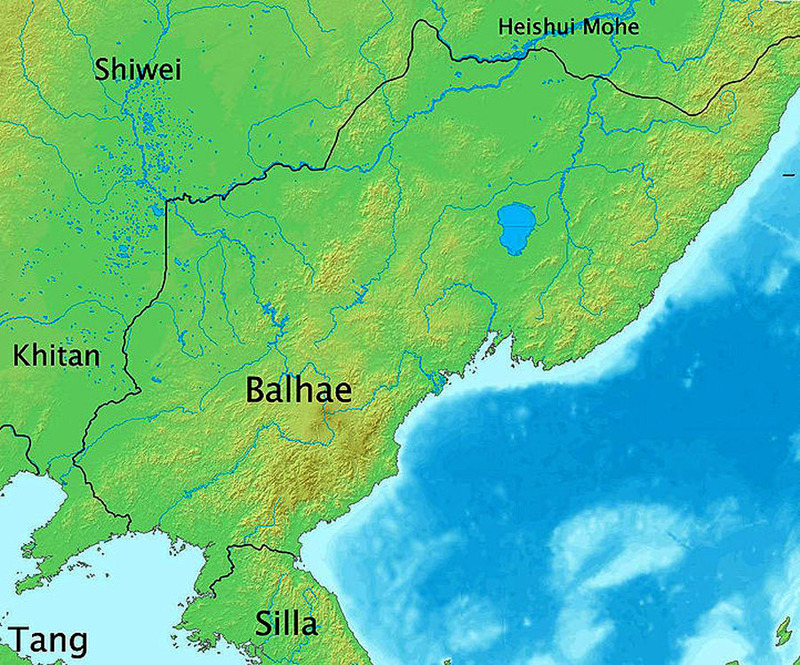 (3) Balhae, also known by the name Bohai, was a Manchurian-Korean kingdom in south-eastern Manchuria and the northern top of today`s North Korea and existed from 669 to 926 B. C.
(4) The Jurchens (also Jurcheds or Jurchen people) were a Tungusic people in eastern Manchuria and the ancestors of the Manchus (the name Manchus dated from the 17th century B. C.). Their language was an old form of the Manchu language. The Jurchen script was developed from the Kitan (Khitan). Presumably, the Jurchen developed from Siberian hunters, who - over time and through contact with Chinese already settling in Manchuria, were in this way sinicized. They were mentioned for the very first time in the year 1069 B. C. In the year 1115 their leader Aguda crowned himself emperor, founding the ; in the following years up to 1125, these then overthrew the Liao-Dynasty ruling the north of China at that time, who had had their roots also with the Kitan in Manchuria. After several campaigns against Manchuria the empire reached its greatest expansion in 1142. In the course of the Mongol invasion in the early 13th century the kingdom was conquered by the Mongols under Ogedei Khan in 1234. During the Ming Dynasty, which ended the Mongolian rule, the Jurchen lived as hunters and, increasingly, as farmers; they came mainly to prosperity through trade with ginseng. The Bronze Age  in this epoch there was further developed metal manufacture with the production of objects made of bronze. In the time from 2200 to 800 B. C. there were created settlements with big fireplaces and sacrificial altars. Food was kept in pots. These peoples maintained contact with the steppe peoples. A very special discovery or finding were the petroglyphs in Sakatshi-Aljan in the Armur region. There were also found huge basal blocks with engraved faces, which cannot be found anywhere else in the Asian region. Presumably, the engraved faces represent masks, which were used for ritual ceremonies. Already at a very early time, masks were an essential piece of clothing for shamans, especially those representing a bird or a deer. The important helping spirit or spirits of dead shamans were called to appear and to arrange the session as soon as a shaman took his cloth and mask (form of Animism and ancestor cult). This discovery has confirmed that masks were originally made from real skulls. People used the same words for skulls, masks, corpse and ancestor. Depicted waterfowls, in general birds are to be seen in connection with the creation of men or for shamans. According to tradition, the first shaman was probably an eagle. Petroglyphs presented also strong connections with the Mohe tribes (TungusicManchu ethnic group), which definitely showed parallels to Turkic tribes in Central Asia. In the east, there was also found similarity with Chinese arts and crafts. The early settlements of Ainu people made an influence on immigrating peoples (such as, e.g. Japan). As a motif they often used a snake or a dragon, which was also used as a synonym. With the Altai tribes this animal was painted with a fish, so-called “Ker-Balyk”  see picture “Dragon” and “Fish”. It may be possible that the Chinese dragon, in the way it is used today, has had its origin with the neighbouring peoples, and not the other way round. Knowing that this representation was still unknown during the epoch of the Zhou, Jin and Han. Patterns of spirals and curved arches were rather common. They were present rather significantly with the Maori (New Zealand), and they did not play an important role in China, which means, they had probably been imitated. Similar petroglyphs of horses with web patterns in the torso region, which were found at the Amur, also existed in the Central Asian region at the Yenissei and in the Altai Mountains. The peoples of Siberia were relatively very early influenced by different movements and tendencies, which makes it difficult today to process traditional beliefs, which were independently developed. Influences of Turkic, Tibetan, Indian and Chinese ideas can be found everywhere. Records of creation myths of the Turks and Mongols are part of oral tradition; moreover, there are also runic script texts. “In the beginning there was only a blue sky and brown soil, then in between these the Sons of Men have been created”. The two main Gods were the God of the Sky (Tenger) and the God of the Earth (Yduk Jer-Sub). The universe of the Turks and Mongols consisted of three levels (Worlds): Lower, Middle and Upper World. Such a belief was geographical widely spread, from Manchuria to the Danube. Thanks to the natural understanding of the environment this natural religion was developed, it is a further developed concept of Animism, marked by hunting and fishing and migrating reindeer farmers. Animism - is a generally illiterate religion of indigenous peoples, in its purest form exclusively to be found among hunter-gatherer cultures. There is no particular religion of Animism. Animism rather stands for religion as for rules concerning the construction of socio-culture and also as a rational explanation of the world in every culture. Animists consider every small part as animated world and pay reference to the awe-inspiring cosmos, which is comparable with monotheistic and mosaic religion. The spiritual world is for them the only acceptable reality. The peoples of Siberia had their own ideas concerning their existence and that is defined as “animism” or “shamanism”, although the last term cannot explain all of the phenomena. It includes a religion that was spread and used all the way from Turks, Mongols and Tungusic peoples, and which is still in use nowadays. Such beliefs were never fix or unified. In order to better understand these, they should be considered as divergent branches with a common root: shamanism, totemism and polytheism under the influence of anti-shamanistic, anti-totemic and monotheistic tendencies in its representation of Tengri, the main god of the sky. Today are to be found mixtures of religious ideas or philosophies into a new system. Forms of original nature religions were mixed with shamanism. The peoples of Siberia were already in earlier ages under the influence of other religion beliefs. Buddhism, Islam and Christianity have gained foothold relatively early trough missionary work. The western part of Turk-Tataric people has already had first contacts with Islam in the 7th century. Forms of Manichaeism have developed since the invasion of the Persian tribes. Great influence exercised the Mongol Empire with its Lamaism in the 12th to the 17th century. An early missionary work was difficult in such remote areas. The Christians were not so dominant as Muslims or the Lamaists in spreading their religion. Today, the majority of the Yakuts, Tatars and the Altai population are Christians. Of course, the conquest has contributed during the Tsarist Empire. However, in Siberia shamanistic ideas are still widely accepted. The shamanism maintained in an original form with the Evenki living in the west (Reindeer-Evenki, Solons, Bargu-Evenki). A mixed form of a natural religion with rituals arose among the Altai, the Burkhanism  Ak Jang “White Belief” (1)  which were celebrated by the priest. These rejected a wide-spread shamanism and worshiped a pantheon with the highest God "Burkhan". A. V Anokhin lived in the Altai from 1930 to 1931. During his activity as a musician in Ulala (Gorno-Altaisk) he studied folklore, music and religion of the Altai people. His work, Materialy po shamanism u Altaisev, was published in Leningrad in 1924, and remained a comprehensive and detailed description of the Altai shamanism. Anokhin studied also “Ak Jang” from 1910 to 1930 and was able to observe the developments thereof. The manuscript is a property of the Altaic Studies Institute Archive in Gorno-Altaisk.  “Ak Jang” had developed in order to replace or to supplement shamanism. He tried to link both traditions of the sun worship using different evolutionary theories of the religion studies in the 19th century. The work of A.G. Danilin is the only published source, which deals both with the theology and the praxis of “Ak Jang” in greater detail. Danilin mentioned manuscripts by A.V. Anokhin. Shamanism was a religion system, free from standards in contrast to today`s well-known characteristic fixed world religions. Shamans used protective and helping spirits, which were called to appear, when there were sessions, which were present in rituals and which were asked for help and for the search of solutions. However, it was partly believed that shamans could not die and that they came from the underworld and not from the heaven (sky). The most important cardinal directions of the Turkic-Tataric people were directed to the east and the west. These directions had importance for prayer ceremonies and were related to the sun's path. One turns towards the east when heavenly beings were sacrificed, towards the west when one praises the ghosts of the underworld and the deceased. It is also said, that when the dead spirits go to the forest, it means that they go to the west. The Mongolian world is directed from north to south. Their Yurt gates (Ger gates) are directed to the south. The south means “front” and the north “back”. The world was thought as a river, the spring of which is situated in the sky and which flows and streams through the world of the peoples. Hence, springs are “holy” and the people passing by stop for a quick break in order to pray. In Siberia most of the rivers flow to the Northern Artic Sea, and that is why the south has the meaning “above” and the north “below”. 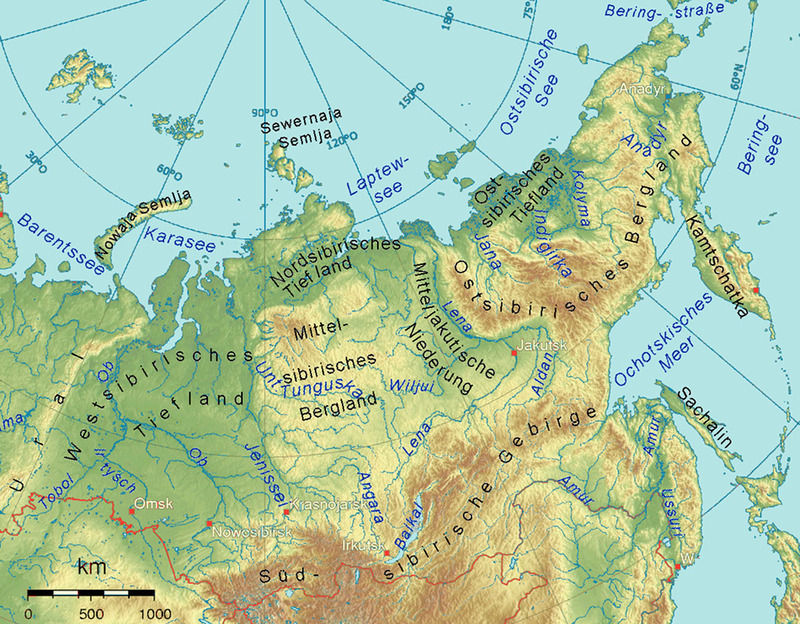 The Ural Mountains are seen as a mountain range surrounding the world, which separates the tectonic plates from the Paratethys Sea (today's Black Sea, Caspian Sea, and Aral Sea are remnants of the Paratethys Sea). In India and in China there are similar concepts. Tectonic plates are carried on the back of a turtle or on the horns of a bull, while the people of the Altai see them as three fishes. People observed already very early the sky und formed myths with reference to the starry sky. A rotation of the Polar Star was already early noticed, thus constituting the centre for many peoples. The sky was thought as a tent, which is connected with the earth through an axis. There are shown the parallels to the World Tree (Stairway to Heaven). This world tree symbolically represents a delimbed birch tree trunk. This lies with its roots in the earth and projects with the crown towards the sky and was thought as a flue connected with the sky. The tribe served as a ladder in rituals for shamans, when they go up to the upper world in trance. In the process, there must be crossed several heavens in order to reach the highest God. The sky was usually marked by notches in trunks as steps or obstacles. Other concepts were presented as the world mountain, an original tradition from India. Although the Altai Mountains were worshipped as holy mountains (Schangria La) and described as a prince, it could not be equated with the World Mountain Meru. Many Siberian peoples had great respect for thunder. For the Altai people it was a typical custom to gather at the first rumble of thunder as a village on a hill, and to shed mare´s milk in all of four cardinal directions for appeasement. It was also typical that there was an idea of magic stones, by means of which a hunter was able to change the weather. This stone was cold “jada-tas” by the Altai peoples, and - if it was carefully preserved - it could retain its power up to three years. Hunting magic rites were common in Siberia. In particular, the hunters tried not to express their intentions loudly while hunting in order not to scare off the animals. Before hunting, there was asked for permission to hunt animals. Afterwards they apologized. A widespread custom was to cut off the hunted animal´s skin around the lips and nostrils, so that the dead animal could not absorb the scent of its tormentors and so the hunters escaped revenge. Bears were especially respected, about these animals should not be spoken badly, so as to not attract their displeasure. People showed such respect also for the fire. It was considered "sacred and holy" and no one was allowed to throw something unclean or evil into the fire, which could reduce the shine of the fire. The fire should not be extinguished with water. Sacrificial ceremonies were widespread, which were presented to the spirits at holy and sacred places. Each dynasty worshiped in their ancestral territory, well-meaning mountains, rivers, lakes or other landscape elements that were considered in some way as having a soul and which were considered protectors of the area. Such as human beings, every animal and every tree had its masters (spirit owners), had a soul and the so-called "öjä". In general, the whole of nature was regarded as having a soul in animism. They believed that the earth could be harmed if it was cut with a knife or if the grass was pulled out. Therefore, there was produced a significant prejudice towards the development of agriculture among the Nomads. People were wearing boots, which were directed upwards, so as to not harm the earth. The piles of stone along the way, “ovoo”, were established for the regional spirits (ghosts). When the people were passing by, they took a stone and put it on the top, asking for blessing for further traveling. It was believed that one of the souls could move outside the body, like in dreams. They are similar to a shadow being (spirits and ghosts). The mission of the shamans was to bring such lost souls back into their own body. The loss of the soul occurred in shock states or when someone got sick. The spirits who harmed people and were responsible for exhaustion or sickness have to be banned. Those were locked into a carved wooden figure. The Altai people also believed that, when the soul did not return within 7 years, this meant inevitably death. The souls of the dead went to the woods, the kingdom of the dead, in the western direction (where the souls joined already deceased in the kingdom of the dead). Deceased were guarded and also ceremonial lamentations for the dead were presented, until the soul will exit the body (after 7 days). There is believed in an outer, second outer soul, which is frequently presented in an animal shape and has a very special role as a help in shamanistic ceremonies. The protective spirit of the Altai people is called “jajuci” and follows people sitting on their right shoulder their whole life long. The evil spirit is sitting on the left shoulder and it is called “kormos”. Both of them keep record of the good and bad acts of people during their life. During funeral ceremonies people must not turn around, in order to prevent that the souls of the dead capture others. Personal objects of the dead, or things these had contact with, are broken and left in the grave, so that they would not harm the mourners. Shamans were mostly burnt and buried in tree coffins on wooden piles, because people believed that the spirit could not leave the body when it was buried in the ground. This is necessary, because the spirits of shamans were considered birds, which could come back at a given time in order to protect their relatives. In this way the call to become a shaman was determined, and they are accompanied by this shaman soul or spirit. It is not possible to learn this profession, it is actually only talent determined by fate; a fate which one cannot not accept. The chosen One often shows this talent already in early childhood by way of trance states, a kind of epileptic seizure. The person concerned is during that time afflicted by the ghost, through which he will also be given instructions. Depending on mental power, a shaman has one or more helping spirits, who assist him in the meetings and whose powers he will assume in trance. This type of funeral, with the burning of trees, may have been common practice for the Altai peoples from early times on, as those haven arisen from ancient rituals. A burial in barrows must have been clearly later developed and could have been part of the Scythian-Greek culture, with the most famous grave findings of that culture being that of a Hun prince in Noin-Ula near Ulga. In the Lamaist world was apparently quite widespread the expectation of a messianic appearance of the last ruler of “Shambhala” of the North (Altai region), a mythical land somewhere in the north of Tibet, a “land of peace and quiet”, which is especially closely connected with the Kalachakra tradition, which is influenced by Vishnuism. According to certain prophecies as a reincorporation of the Tashi-Lama (Pan-schen Lama), the Lamaist people will be led at a time, when Lamaism will be at a low point, into the final and decisive battle against the enemies of their belief. (In a very special prayer, the followers pray and ask for participation in a future life among the army of Shambhala, fighting against the enemies of the Dharma). The Shambhala myth is an adaptation of the early Hindu myth of Kalki of Sambhala (Shangri-La), which may be found in Mahabharata and Puranas, This is seen a pure land in terms of Buddhism, a fairy-tale-like kingdom, the reaction of which is visionary or spiritual, as well as physical and/or geographical. These Shambhala concepts differ greatly from the concepts and beliefs including the re-appearance of the heroic king Gesar Chan. Gesar, according to scripts of more than 170 years also known as Gesser Chan, is an epic Tibetan king, whose heroic adventures are presented in songs, which are called the Gesar Epic in their entity. This epic is one of the biggest and most comprehensive epic cycles. These narrations include the fundamental motif of the war of the good Tibetan former ruler Gesar, also known as Kesar or Geser (Gesser-Chan), which had been born as a human being but nevertheless bore many divine talents and abilities, against the Evil in the world. His warrior and clever actions are presented throughout Central Asia from Ladkh as far as Mongolia and the region of Buryatia, especially, however, in Eastern Tibet, in the form of songs, which is why it is most frequently called Gesar Epic. It is a rather comprehensive epic and has its beginnings with the creation of the word; most probably it was planned for presentation lasting several days. It tells of the return of the heroic king with this army establishing peace throughout. Had been the most prominent religion in Tibet before Buddhism was established. For Bon followers the name stood for “truth, reality” and “true teaching”, wherein such as Shambhala is also known as “Olmolungring“. Upon the expansion of Buddhism in Tibet, there was existent a mutual influence for both religion, wherein the Bon provided mainly Shamanistic elements to Buddhism. The so-called Old Bon is related to pre-Buddhist rituals and religious concepts, the system of which is significantly different from Buddhism as well as from Later Bon. Whereas the Later Bon has assumed the teachings of karma and reincarnation, the Early Bon is mainly focussed on life after death, so that funeral rites and rituals had become very important. In this connection, animated natural phenomena (see animism) and the control and appeasement thereof by way of magic rituals played in important role. There was a pantheon of its own for deities, ghosts, demons and other spiritual beings, which have assumed an important role in rituals and cults. The magic rituals of the Bon are concentrated on, e.g., trance experiences, sacrifices to deities, fortune telling, travels to the Lower World, weather magic, the medium-like contact with ghosts and spirits as well as the defence of demons. Their mystery plays, in which mask dances (Cham dances) and songs were performed, have been assumed and adopted by Buddhism; as well as Phurbas, the magic dagger. At this time also amulets and lucky charms were rather common, which were worn as a kind of jewellery. Reticules, Mdos, were produced as ghost traps in order to guard and protect houses. As the Bon has originally been a magic religion, a great may detailed narrations (myths) or tractates, which were also ritually recited, share a special regard to the origins of magic and magic tools. Holy places are not only real but rather also spiritual places and are of great importance in the Bon mythology. The Kailash is the seat of the heavenly deities, centre of the world and connection between sky (heaven) and earth. In the 6th to 2nd century B.C. the Pazyryk culture found a home in south-western Siberia. A characteristic element thereof are burial fields, so-called Kurgans: these were piled stone heaps, in which people and horse were buried with burial objects in tree coffins. Excellently conserved remains are mainly concentrated on the Tujekta-Baschadar-Pasyryk culture in the northern Altai region. These are probably imperial burial sites on the Ukok Plateau (see photo), being situated some 3 m deep in the permafrost soil. By way of water entering, which then froze, there was formed a thick ice layer above the burial sites of Ak-Alacha, underneath which materials such as wood, leather, wool and, naturally, also human remains were preserved and conserved in an excellent way. Ak-Alacha is the highest located archaeological excavation site in the Altai. In lower regions, there were merely formed frost caves in the burial chambers, which, however, did not project beyond the heaps of stones. Ukok Plateau is geographically an expansive plateau on a level of 2,500 m, in the uttermost south of the Mountain Altai. It borders western Mongolia, western China and Eastern Kazakhstan. 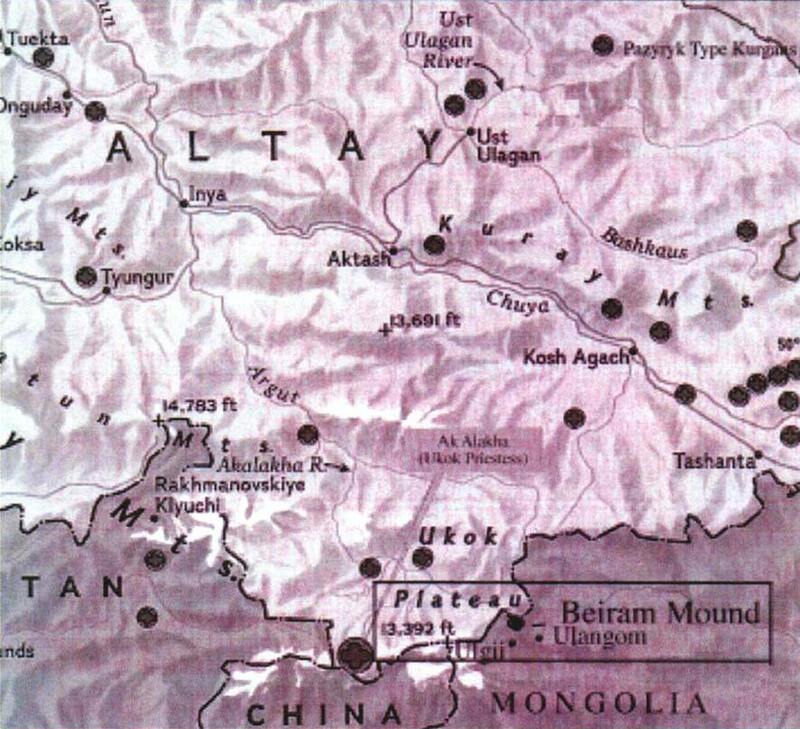 The mountain range of the Tabyn-Bogdo-Ola, the so-called five holy mountains, are a separation of these countries. From early times on, the Ukok Plateau has been marked by its tree- and bush-less vegetation as well as by numerous swamps and lakes, wherein it was mainly used by nomadic cattle breeders as winter grassing lands. If the valley is covered by a thick snow layer in winter, the Ukok Plateau is more or less of free of any snow due to the strong winds prevailing, so that cattle and horses could grass in excess. The people spent winter in wooden huts made of larch wood and erected fenced enclosures for their animals. The deceased were buried next to the settlements in burial mounds. 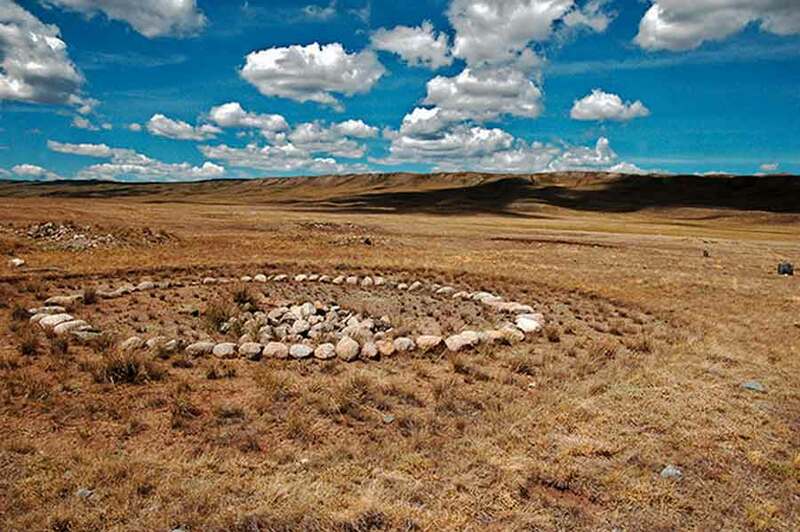 The huge amount of graves from the Paryryk epoch on the Ukok Plateau indicates the great importance of the grasslands as well as a long utilization thereof as a sacral territory for the dead cult. This is, however, contradicted by dendochronological research (teaching of the age of trees) regarding tree trunks used in these burial sites. This indicates a relatively short utilization of the burial site of 100 years. In the stone remains, always situated in the west of the Kurgans, there can be found animal bones and traces of fire sites; whereas in the east thereof there are frequently found series of stone plates buried vertically, which could have been used for tying up horses. Further kurgans were found in Kudyrgé, which is situated in the eastern Altai near Chulyschman River in the proximity of the confluence of the Baskau. The valley is rich in wildstock, and there are iron-ore and copper deposits at the river course. In spite of the rather limited growth of grass, there were kept livestock breeding at the hilly sides of the mountains, which reach up to 3,000 m. In the valley, there is found proof of irrigation systems from the 7th century on. Also rather common stony enclosures around the burial site Kudyrgé are indicators of an intensive settlement between the pass Kotu-Jaryk and the village Balaka. In Kudyrgé there are found stone enclosures and burial sites dating back to the Old-Turkic epoch (6th to 7th century A.D.), furthermore also burials from the Mongolian time (13th to 14th century A.D.). In the Ukok Plateau, people were buried with their head facing the north-east, whereas in Kudyrgé they were facing southwards. Also the construction of the arch and the quiver were made of elm wood. Burial objects prove that these people had migrated from the south, probably the Tien Shan. Here, there are not found any vertically arranged stones. The same manufacture techniques regarding harness shows exchanges among these cultures. This technique was existent already in pre-Christian times and is found in all burial sites. Ak-Alacha comprises 6 kurgans and stone assemblies for the death cult. The stone assemblies, which are always situated in the west of the kurgans, there are found animal bones and traces of fire sites. In the east, there is often found a series of vertically buried stone plates, the so-called Balbal. The nearly square-like mound is enclosed with wood. In order to prevent disassembly of the walls, these were compressed using stones after the burial. In the burial chambers there are found horses, individual ones or group thereof, having a comprehensive set of harness and saddle covers, as well as horses in the presence of human beings; burial objects were all kind of jewellery and weapons. An especially distinctive and typical element of these Scythian period are mirrors, which may also be seen as a symbol of a married couple with the couple found in Ak-Alacha. Such mirrors were very popular among the Chinese people. In the Scythian period, it was a common practice that a couple looks in the mirror for officially sealing the marriage. A huge amount of Kauri shells in a woman’s grave represents prosperity and wealth: these shells had probably been braided into the braids of the woman’s hair, as had been custom in the Altai not very long ago. The shells, however, were also an attribute of the Turk deity “Uma“ in her function as a symbol of fertility. Jewellery is frequently found in the form of animal representations, including snow leopards, boars and birds, carved from wood and covered by a golden foil. Especially characteristic are coins, which were found in graves, having depictions of horse, ibex and bird. These were made from red felt, having a high-rising tip, onto which there was placed a horse figure made from wood. Their clothes had in general been similar to those worn in the Scythian period. Fish ornaments were typical, but only in the Altai region. This ornament is depicted rather differently to the Scythian iconography. Fish depictions from the Pazyryk culture show the Nalim or Lota-lota. This is a predatory fish, which is always represented in the same way, having three pairs of fins and viewed from above see sketch of fish. This fish plays an important role in Siberian mythology as the ancestor, being an integral part of shamanistic mysteries for healing the sick and the ill. 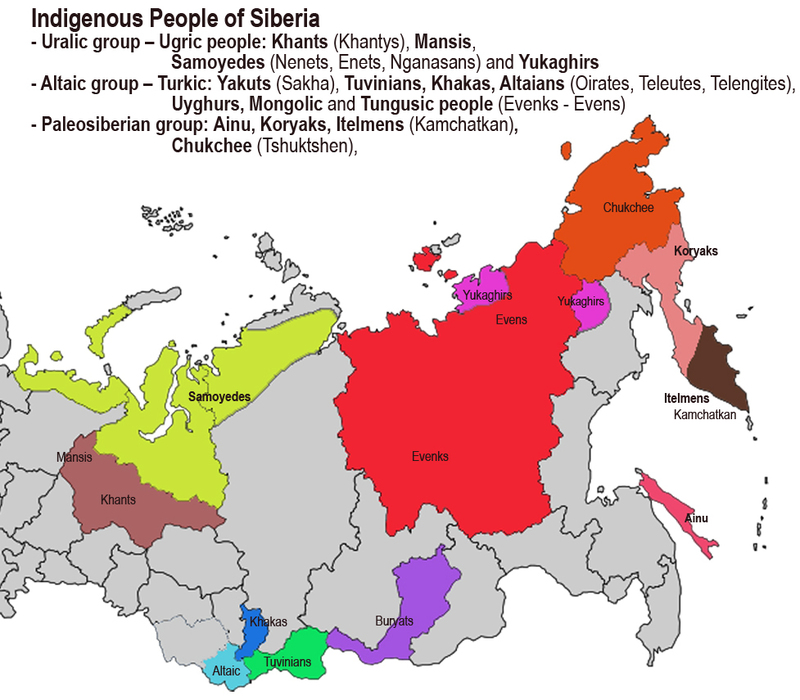 The biggest group are the Ugric peoples of the West Siberian population: the Khanty, Mansi, Voguls and Ob-Ostyaks, who live in the forested expanses. Their neighbours are the Samoyeds, Nenets and Selkups. They all belong to the Uralic language family, comprising all the Samoyed and Finno-Ugric peoples. 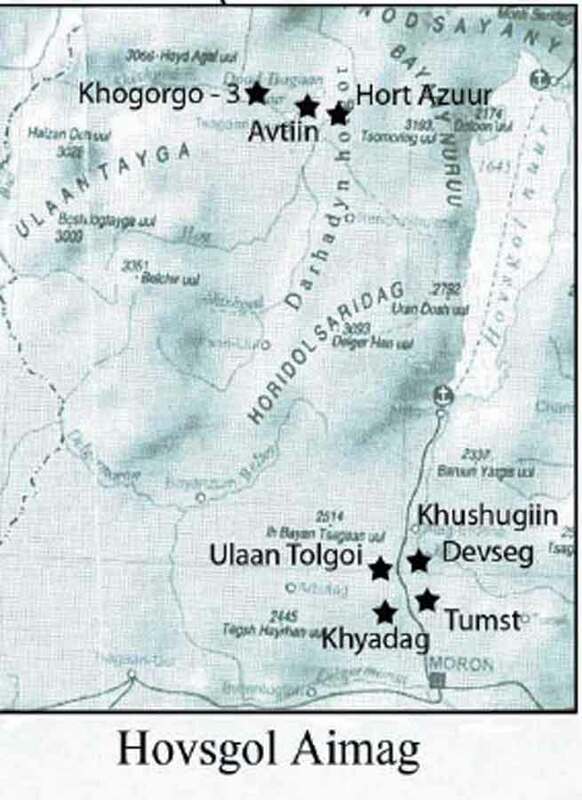 In the steppes and forest steppes of southern Siberia settled Turkic peoples including native assimilated Turks, who had belonged in the past to the language family of all of the Samoyedic, Tungisic or Paleosiberian peoples. Among them numerically the strongest are the Altai Turkic tribes (Altai-Kizhi), the Khakass and Tuvans. The Altaic language family includes all Turk-Tartar, Manchu-Tungusic and Mongolian languages. The Yakuts also belong to the Turkic peoples, but have migrated from the upper Yenisei River to the north, before the Mongol invasion in the 13th A.D. In the taiga and tundra forest, east of the Yenisei, forest hunters and reindeer herders have always been wandering the open planes, the Evens (Lamuts) and Evenki (Tungus). 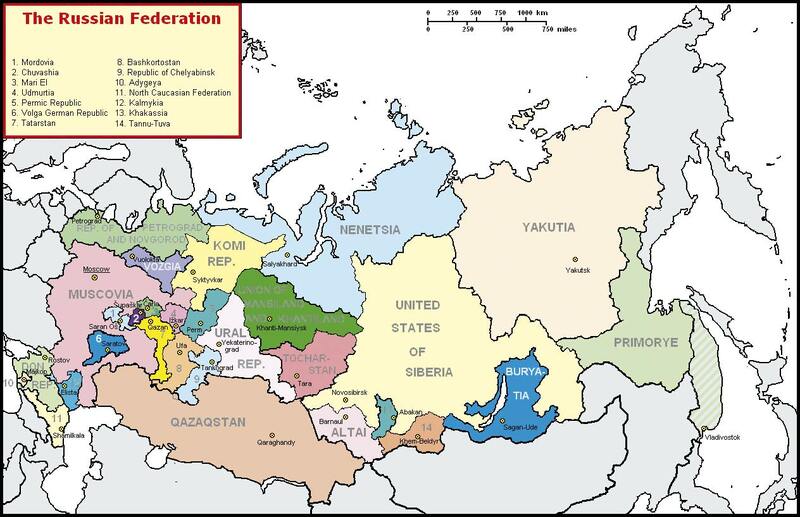 Apart from the Mongolian Buryats in the Baikal region, the numerically largest group of the East-Siberian population is the Amur population; the Nanai, the Ulch people and the Gilyaks. They belong to the Paleo-Siberian peoples, like those living in northeast Siberia called Chukchi, Koryak, Ainu and Yukagirs, who are the descendants of indigenous people. A small group in Central Siberia, which belong to the Tibeto-Burmese isolated language family, constitute remainings of the indigenous population: the Ket people. In the 17th and 18th century A.D. they were still numerous on the west bank of the upper Yenisei, represented by tribes like the Kott people, the Assans and the Arin people. In addition to the Ket and Altai people, there are nearly 30 other peoples still considered as very small minorities, who are threatened to be extinguished. Buryats (also Buriats)  are descendants of the Mongol tribes and the biggest group today, which are settled on an area, size of Germany, in the East Siberian region. The half of the population live in the today`s Republic of Buryatia, the rest in autonomous areas near Irkutsk, in Mongolia and northern China. Their original habitat before their expansion was the Olkhon Island on Lake Baikal, where still exists extensive sheep farming. Their clothes is the chalat, a, colourfully printed coat made of silk or light cotton. They are also wearing soft sheepskin boots and a pointed, conical felt hat. Their national dish is a dish called posy, meat-stuffed dumplings. The accommodation of the Buryats were hexagonal to octagonal one-room log cabins, which were imitations of a yurt model. Previously, they were connected with shamanism, later followed by a transition to Buddhism. The Dukha are a small Tuvan (Tozhu Tuvans) Turkic community of reindeer herders living in northern Khövsgöl Aimag of Mongolia. This nomadic culture, having developed in the Bronze Age, has a three thousand year old history. Livestock keeping with winter and summer pastures, wild animals hunting and religious practices in holy places have been maintained to the present day. Settlers constructed great, enduring monuments such as from the Bronze Age: Khirigsuurs (1), Deer stones (2), Stone men ('Balbal' - 3) and also stones with inscriptions. The modern nomads in Mongolia and their Central Asian and Siberian neighbours have ubiquitous Ovoo (4)  mass of stones (rocks) or tipis made from sticks or rods erected on mountain passes or crossroads, or at difficult passages and river springs to worship the spirit master (The Lord of the place). Ovoo change and grow with each visitor, stones, rods or other objects are added. It is a ritual performed, circling three times in a clockwise direction, to ask for luck for further traveling. It is still not known whether the local settlers have maintained today this Ovoo ritual in a spirit worship or continued to exist as superstition. There are monuments or places, important and sometimes more ephemeral (temporal), where there is actively celebrated only on a specific day or situation, including as such ghost worship with Ongons or other sacred objects. Ongons; is symbolically meant as a house or place, where such spirits or souls of deceased live. The Ongon signs were regularly fastened to “untouched” or “uncut” manes at the withers of horses or of Mongolian ponies; such as bands as seters, stuffed towels or bone or stone figures made of carved wood, able to keep the spirits off; which were in fenced Asars (squares) and served for worshipping dead shamans, or in holy places or ceremonial sites that are selected by the community. Even deer stones or stones such of such Turkic men (Balbal) from the Bronze Age are today worshipped as Ongons. They are decorated with Buddhist prayer cloths, Khadags (ceremonial scarf of silk, usually blue) and with yellow anointing. Also remains of burnt incense or animal bones were placed at its base. (1) Khirigsuurs - The khirigsuurs were large and complex ritual sites that are major features in the landscape of the Bronze Age. A khirigsuur is a structure including a central mound and a round or square surrounding frame. The central mound is often marked by a large standing boulder. Modern studies question this - whether they are truly nomadic culture of the Bronze Age and their function remains uncertain - are they grave monuments, ritual places or places for other celebrations. (2) Deer stone (also known as reindeer stones). A number of ideas about deer stones differ from those in centrally-Mongolian species, which have very long body and legs in running motion and are not waved. They also have small eyes. There weren`t noticed any belts or tools and also any presentations of solar discs or moon shapes. The grooved ring is attached only at the top positions in such stones. Deer stones could be dated from the Afanassiewo culture 3,500 to 2,500 B.C. years ago. (3) Turkic stone  human figure “Balbal” - Turkic grave stones before Mongolian time and similar egg-shaped stones could be presented as pagan monuments after the death of tribal princes. Such ideas were never used as grave stones, because the body of the deceased was burnt, and the ash was left to the wind. Stone sculptures should be remember on these faces or intellectual properties. Settlers from this period believed that the body of a man was made from dust and stone and that the body must be returned to earth and stone. In their opinion, after the death organs become stone, which are then erected and present a kind of storage of the memory and knowledge of their ancestors. In some way, this is considered a kind of tin god concept, but these balbal have never been used as tin god presentations or as idols of the deceased. They rather were the gateway to the spiritual approach of an ancestor cult. These balbal may be taken as a reminder on the deceased in consideration of the people who lived long time ago. (4) Ovoo  masses of stone or tipis made of poles and rods, which were found at mountain passes, at crossroads, on difficult passages and on river springs, worshiped a spirit-master (Sir, ruler) of such places. As a rule those landscape symbols were made of stone or wood. Ovoos were often found on the top of the mountains and in high places such as mountain passes. They served primarily as a religious site, in order to worship the mountains, the sky and the local spirit masters. They are currently also used in Buddhist ceremonies as sacred place. These sacred places and objects mix religious practices and the worship of the fire, sky, earth, water, ancestor cult, shamanism and currently also include Buddhist concepts. Heavenly gods and spirits of the underworld were mixed along with numerous Buddhist animist gods with the three-world-cosmology for rituals. The religious traditions were celebrated by the clan elders and represented a form of an ancestor cult; Buddhist Lamas celebrated also the worship rituals. Shamans negotiated, struggled and tricked those underworld spirits in rituals. Sacred objects and their places represent separate but somehow associated traditions, which are handed over by way of ritual orders, in their practice - Buddhism, Shamanism. The worship of a spirit master of the place, ancestor at Ovoos or Ongons were called to appear at local stones, rods, built altars (stone slabs) or trees. The shaman trees in Darkhat Valley are big, lonely trees and also sacred, after they were marked by lightning. Like their neighbours, the Buryats, they put the ash of the burnt Shamans into the deep holes under those trees. Such sacred places permit communication with sacrificial offerings to spirit-master of the place  mountains, wood, or mountain`s passes, rivers, lakes, and with deceased. Help is asked for from the soul spirit, as well as their appeasement by way of rituals, for the protection of the herds, for health and prosperity of the community. Those traditions are still alive nowadays, and they are celebrated by the shamans and  at present times by the monks (lamas), too. Ceremonies for spirit masters of the region, of the sky at the ovoo thereof or ongons may be carried out only by the clan elders or priests. In contrast to Buddhist traditions and the people living in the Darkhat Valley, with herds of sheep, goats and cows, and living on hunting and gathering, are the Dukha reindeer herders (also called Tsaatan - 1). They are strongly connected with the Uriankhai (Tuva tribes) and their shamanic practices. The first act of their ruler is, when they arrive at the holy places, to perform such cleanings and repositioning of rods that had fallen down. In rituals there were used milk and cheese, incense juniper or other aromatic herbs, combined strips of white cotton cloth on objects. Milk is thrown towards the sky with a tsatsal - a traditional wooden spoon - and concurrently, they call out the names of many cities, mountains and rivers and rotate clockwise. Several 5 cm long wide strips of cotton are then bound to each of the rods, and on the altars there are placed small pieces of cheese. As a final ritual, they blow incense on the altars, in order to perform a cleaning with the aid of smoke. The ceremonies were led by the clan elders or priests, which begged and prayed to the spirit of the master Kharmai to protect younger leaders and family members. Worship of the spirit master and the animals is also performed. Apart from the protection for the clan members, they also ask the Ovoos for protection and good luck while hunting. Important Ongons, where such spirits, souls or dead shamans live, are objects, like a figure made of wood. These figures, in which the souls and spirits are resident, are decorated and treated with milk and fat. They get a place in the homes of people with the aim of asking for pacifying and taming other spirit souls. Certain souls are considered dangerous and can be held under control only with strong auxiliary spirits. They tried to lure their families, especially the children, into the underworld in order to create a parallel life. Unlocked spirits of deceased are ready for a rebirth under the control of a master spirit. By way of Ongons families honour the souls of deceased ancestors and ask them for protection against the hostile spirits, also with shamanistic magic they keep these souls of family members in a good mood. Such Ongons were made by shamans and are also used in healing ceremonies, when the illness spreading spirits are burnt. Ovoos and Ongons serve for the worship and they are used in ceremonies, they are sacred sites and objects. They serve for the admiration of the spirit master of such places or hunted animals, or deceased ancestors (ancestor cult). They ask for happiness and protection from the spirits, who live in those objects. Special assistants (helping spirits) are called to appear, on special days or in daily activities. These practices with worship integrate various liturgical traditions  Buddhism, Shamanism of the Darkhat Valley or Dukha Shamanism, having many similarities to the old beliefs and the soul travels between the worlds: a present, earthly world, a heaven world, and an underworld. With the help of spirit masters their control is sought. (1) The Dukha, Dukhans or Duhalar (Mongolian: Tsaatan) are a small community of reindeer herders living in the woods near to the lake Khovsgol and on the spring of the Yenisei, north of Mongolia, on the borders of Russia and Tuva. “Tsaa” means “reindeer” in Tsaatan: “those living with reindeer herders”, the name has actually Mongolian origins, but they rather call themselves “people of the Taiga”. Today, they belong, like the Tuvans, to the Turk-speaking people in the Altai. The reindeer is a source of food, clothing and a monetary currency. They re-established their nomadic life-style in the 1990ies, and the most of them stayed loyal to animism and had their own shamans. A Turkic-speaking people, settling at the upper Yenisei basin and strongly influenced by the Buryat culture. They are still traditional hunters and herders / breeders (sheep, cows, horses and yaks), are originally from the area of today`s northern Mongolia and maintain the Buddhist beliefs and shamanism. In the 18th and 19th century they were a part of the Chinese Empire. In 1921  1944 they became an independent republic. The most of them still live in today`s Outer Mongolia. The Soyons are a people that settled in an area south to the Russian border, in the area on the Khemchik River, a tributary of the Yenisei, and at the shores of Kara Kul (Black Lake). They called themselves Tuva People, Tuva-Kizhi, led by a Zaisan, who is subordinate of a Soyon prince, the Münko. They are nomads and live on livestock keeping. Their greatest wealth consisted of cattle; sheep and goat herds were insignificant, but the least they owned were horses. Therefore they used both oxen for riding as well as for transporting loads. Agriculture was only a little used in practice, and they solely grew barley. In contrast, hunting was a favourite pastime; they are known as excellent hunters. They wandered like their neighbours, the Telengits (also called Dwojedans, who lived at the Chuia) in hunting communities, and so they also wandered these unfavourable areas for many weeks, in summer on horseback, in winter with snowshoes. They also built huts in many places, made of branches and available for the hunters, which used them in winter, just like their neighbours, the Tölös in the Altai (Tölös-people also described as Tscholyschman residents, who settle on the south of the Lake Teletskoye (Altyn Kol - Golden Lake). The food in summer was mainly milk, also Kumys (mare's milk), that was enjoyed as curd, cheese and milk brandy. Meat, also from wild animals, was also on the table, wherein, in comparison with the Altai people, they hunted in summer, too. Horses and oxen, which were used for riding or for carrying loads, were not slaughtered. The Soyons also indulged in root digging and enjoyed Kandyk, lily roots, Kalba (allium ursinum) and wild radishes, which they collected in large supplies for the winter. They lived in felt yurts like their neighbours, the Altai people and the Dwojedans. The interior furniture of the yurt was also more or less the same, but only instead of the leather bags on the walls, there were stacked Chinese boxes made of wood, and on the floor were rich carpets. The clothing for men was very simple and consisted of short leather trousers, boots and fur. Only the rich ones wore shirts and jackets made of cotton. On the heads, which they shaved like the Altai people, they wore Mongolian caps that were filled with lambskin. Women wore long skirts made of cotton or fur. The hair of the Altai women was in the form of two pigtails, but they did not attach any kind of jewellery, as was the case with the Khakas people. The religion was the same as that of their Atlai neighbours, hence, shamanism; further to the east, however, Buddhism came into existence. The belief in banning the weather was rather common among all the peoples in the Altai, as well as with the Soyons. There are certain families, where the sons inherit that ability from the fathers. Some of those weather forecasters were famous and it is said that there were people who dominated the weather so strongly, that it was possible, that the sun shines straight in the face in the same moment when the rain soaks the back. In order to forecast the weather, they used a weather stone (jada tash). Their language is also a Turkic dialect, which is, however, different from the Altai dialect, which means that they had difficulties to understand each other. It is assumed, that the Mongolisation of the Soyons was very strong, and that is why the Soyon language disappeared. Still, they have a rich repertoire of songs. Their Mongolian neighbours had a greater influence on them in regard to customs and language than the Altai people. Their deceased were placed on a framework and were covered with garments. Their sacrificial sites were similar to those in the Altai, including four strong poles. Next to the dead person, there were arranged bridle, saddle and stirrups. The Soyons, which settled at the Kemtshik River, formed two tribes: the black Soyons (Kara-Sojong) and the yellow Soyons (Sary-Sojong); the black Soyons lived in the proximity to the river, on the other hand, the yellow Soyon lived inland in steppes. Their size was more important than that of the Altai people, and their faces had a more elongated shape. The tribe of the Sary was numerous. The blacks supposedly mixed with the Kyrgyz. The Soyons originally settled on the banks of the river Oka, a tributary of the Angara, which had its origin in the Sayan Mountains in the west of Buryatia. 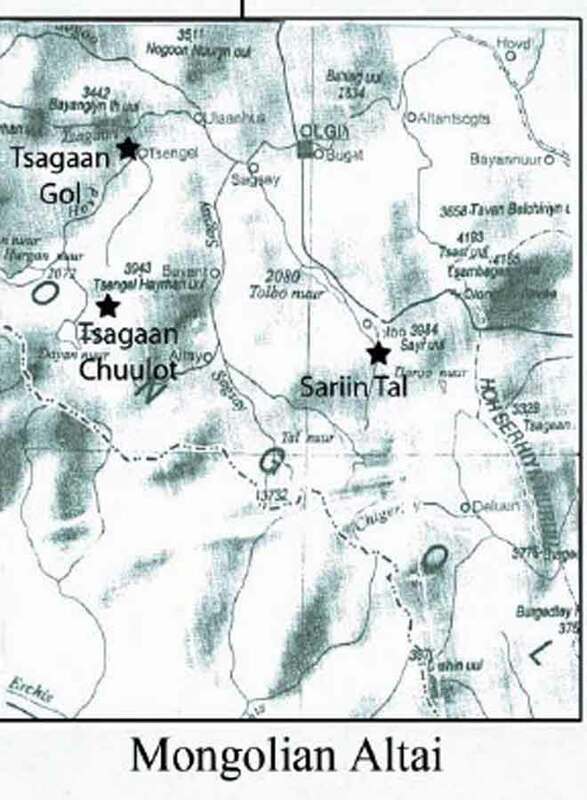 Wilhelm Radloff, who travelled from 1859 to 1870 in the Altai-Sayan region, reported in chronicles of 1861 of the Soyons (Soyon=Tuvans), of people, who settled at the Kara Kul, in today`s province Tajga Bay in the north-west of Tuva. They live in the north of the Republic of Tuva. Furthermore, they are nomads of Turkic descent, who have mixed with Samoyed aborigines. Shamanism is still their most important religion. - a Turkic speaking, ethnically mixed population. L.P. Potapov (1905-2001) was born in the Altai and began his academic career as a protégée of Anokhin in 1924. In the late 1930s, he was one of the most influential figures in the Soviet anthropology and ethnography. He specialized in Siberia, especially the Turkic groups in southern Siberia, including the Altai. From 1948 on he was director of the Leningrad Institute of Anthropology and Ethnography, and de-facto expert on "Soviet Anthropology". Writings of L. P. Potapov also contain records of Anokhin. This portion is based on reconstructions of historical traditions of the Turks and Mongols, as well as archaeological data, which were found in Kurgans. It is also based on old Turkic inscriptions on stones, Chinese chronicles, which were written from Turkic sources, as the writings of Irq Bitiq, found in Dunhuang, "The Book of Divination" from the 10th century (an ancient oasis city on the Silk Road in the Gansu Province in western China), as well as note provided foreign Turkic and Mongolian visitors. In the Pazyryk culture from the 6th to the 2nd century B. C. the symbolism of a cross-shaped rosette was custom, which represented the universe or the sun. This culture is assigned to a Europoid people, to the Ugrians, who migrated from the Ural towards the north into the southern forest-steppe. This is also visible with Scythian tools made of bronze that were found, which served in sacrificial rites. Here the tribes had adopted Turkic features, or they were entrained by primitive peoples moving to the west. But one part of this forest Tatars continued holding on the Altai foothills. However, the western-Siberian population had largely Turkic origins and the Turkic  Ugric rulers had left their grave inscriptions in a runic script. Similar runes were found in Bulgaria, too. Nomadic tribes moved in the 1st century B. C. from today`s Xingjian China to the Danube. 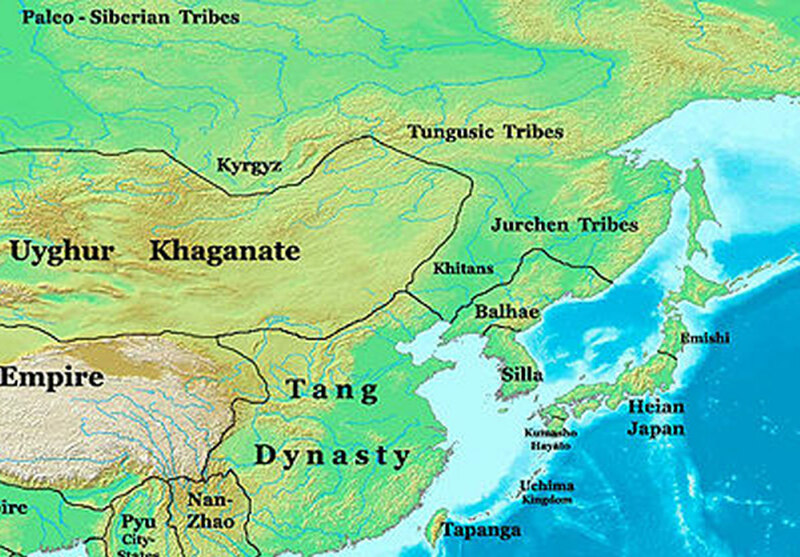 In Central Asia, the Altai and Mongolia there was established a Khanate with a Turkic upper class. At that time there existed a contacts of Turkic tribes with the Mohe tribes at the Amur. They left ideas of petroglyphs from that period, as can be seen by way of some ritual objects and practices, as well as jewellery and clothing. The influence of these mixed Turkic-Mongolian peoples who settled in this Siberian area was larger than people previously thought. The Telengits (Dwojedans) had long been Chinese subjects, and they paid charges to the Chinese in February. They remained independent under their administration for a long time. Their leaders, the Zaisans (Temitschi or Schülöngü), were still obliged to pay the Kalan to the Russians. 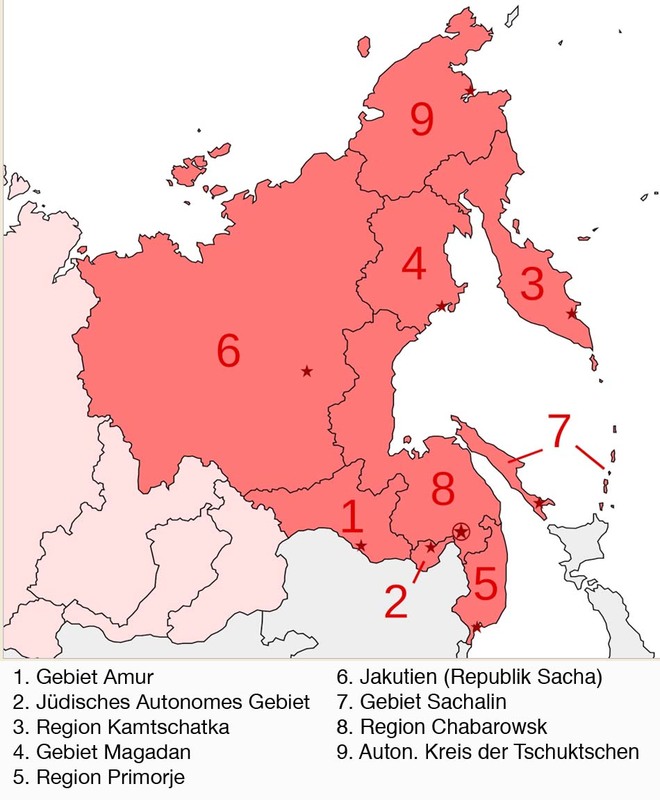 In 1865 the Telengits (Dwojedans) had to choose between two alternatives, either to leave the country or to recognize Russian dominance. They settled mainly in the river areas of the Tshuja and their name - Dwojedans - has the meaning "twice subject to interests payment", because they had to pay taxes both to China and Russia. In addition, the Tscholyschman residents are also designated as the Tölös people and the Bashkaus River people residents as Ulan people. The first designation is very understandable, since they have established the oldest population of the Tölössen on the south of the Lake Teletskoye (Altyn Kol - Golden Lake) ever since and are descendants of the Dwojedans. The Forest Tatars, also Black Forest Tartars, at the Kemtschik River and the Uriankhai of the Mongols were called Tschernevi-Tatari by the Russians, but they called themselves Tuva-Kizhi and Jisch-Kizhi  the peoples of the Forest. They also live in the forest mountains between the river Katun and the Lake Teletskoye (Altyn Kol - Golden Lake) as semi-nomads, farming is of lesser importance. They mostly hunt and gather cedar nuts. They traditionally come from the east and have mixed with their neighbours, the Altai people. The majority is of Shamanistic confession. Shors (also called mountain Kuznetskie Tatars, Kondoma Tatars, Mras-Su Tatars) settle between the Altai and the Sayan mountains, along the banks of the Kondoma River, and live on hunting and fishing. Ak Jang - Ak (white = drinking at a ceremony with Kumys (fermented mare's milk)) - Jang meant not only faith, but rather included also a social rule of behaviour. This may as well be regarded as a kind of political system (resistance). Ak is also an Old-Turkic name for "Yang" from Chinese Universism and "Kara" for "Yin". In the Ak Jang there was celebrated a doctrine of death based on the law "Yang" and was placed above the theory of "Yin". 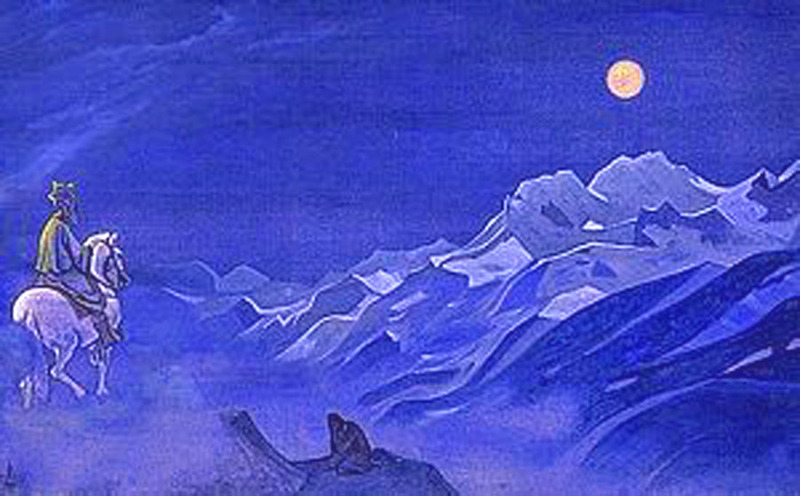 Nikolas Roerich (1874-1947) was strongly influenced by such beliefs. He was actually a Buddhist, but dedicated himself to Burkhanism. He is also known for his picture of the Oirot messenger, the "White Burkhan". The Burkhanism, which now exists in the Altai, is not the same of the Chet Chelpan of 1904. "Tengrianstvo" - a new "tradition" is born, which has supporters both in Gorno-Altaisk and in major rural centres. All that is due to Nikolas Roerich’s wife’s inspiration, Elena, whose medial or channelling abilities were well-known and led to spectacular forms of a Agni Yoga, a trend for the reinterpretation of Ak Jang. Missionaries took advantage of the use of herbal smoke in rituals to worship the sun and the moon within the meaning of Burkhanism. Chet originally used also elements from Buddhism. His students later included spiritual practices and shamanic traditions. In many ways, they had expected greater spiritual effectiveness with these elements of Buddhist symbolism and ancient shamanic traditions, mainly in a first phase of this radical movement. It must be noted, however, that the Tibetan Buddhism has never been comprehensively established in the Altai world, as happened in neighbouring Mongolia or Tuva. In prayers, they changed their highest god of heaven, "Bulan-Tokoi" (once was the capital of the Dzungar Empire) into "Tokyo". Similarly, also other prayers suddenly paid reference to “Japan” or contained “anti- Russian” passages. The "Yapon-khan" is actually a misunderstood name, as Rigden Gyapo (Japo) - the title of the Shambala king and / or Maitreya. Women as well as men were yarlykchi (messengers). Some of them became Ak Jang priests, after they had gone through similar states, as there are known for “Shaman” initiations. After 1906 the Ak Jang gained further popularity with a Pantheon mixed with old, traditional deities, especially Jajyk (Jajyk = God from the early Turkic-Mongolian tradition) - a formless God, who mediates as a messenger between heaven gods and humans. These later on also included the concepts and practices of shamanism and Buddhism. These everyday topics and images of a "golden Altai" were sung about and paid homage to by way of rituals: white mare's milk, white mountains, birch forests, beloved homeland. The good leader (warrior hero) who will bring freedom back to the people. Representatives of good and evil powers, as Ul'gen (creator) and Erlik (Lord of the Underworld), have disappeared with the rise of Burkhanism, and they were then replaced by the universal God "Burkhan" (see drawing by Roerich - White Burkhan). Nicholas Roerich - a famous Russian occultist and artist, promoted the "Agni Yoga" - a mixture of Buddhist (mostly invented), "esoteric" Christian and spiritualist mixed elements that resembled theosophy (divine wisdom). The central point of this doctrine was the "Search for the Shambhala." He and his wife Elena Roerich, who was a celebrated medium, produced a series of "Shambhala prophecies" that became very popular in the late 1920s. They were travelling through the Altai, as it was recorded in Roerich's book, "The Heart of Asia ". A.V. Anokhin  lived in the Altai from 1910 to 1931. During his work as a music teacher in the Ulala (Gorno-Altaisk), he had actively studied folklore, music and religion. His work, Materialy po Shamanstvu u Altaitsev, which was published in Leningrad in 1924, and remained a comprehensive and detailed description of the Altai shamanism. Anokhin studied also “Ak Jang” from 1910 to 1930 and was able to observe the developments thereof. The manuscript is a property of the Altaic Studies Institute Archive in Gorno-Altaisk.  “Ak Jang” had developed in order to replace or to supplement shamanism. He tried to link both traditions of the sun worship using different evolutionary theories of the religion studies in the 19th century. remains a full and detailed presentation of the Altai shamanism. Anokhin also studied "Ak Jang" from 1910 to 1930 and was able to observe the developments thereof. The manuscript is in the property of the Archives of the Institute of Altaic Studies in Gorno-Altaisk. - "Ak Jang" has emerged to replace or supplement shamanism. He tried to combine both traditions of the sun worship towards evolutionary theories of the study of religion from 19th century. The work of A. G. Danilin remains the only published source that deals in details with both the theology and practice of the "Ak Jang". Danilin mentioned manuscripts of A.V. Anokhin.  the second strongest ethnic group, who once settled at the upper Yenisei and migrated to the Baikal region in the 9th century. However, they were then displaced by invading tribes to the islands steppe of the central Lena. There they partly mixed with the Evenki (Tungus). The Yakuts are descendants of the Turkic tribes who had migrated once in the Altai, and they have a rich independent culture. It was the Yakuts who had brought ceramics and blacksmithing up to the north. They lived purely from cattle and horse breeding. 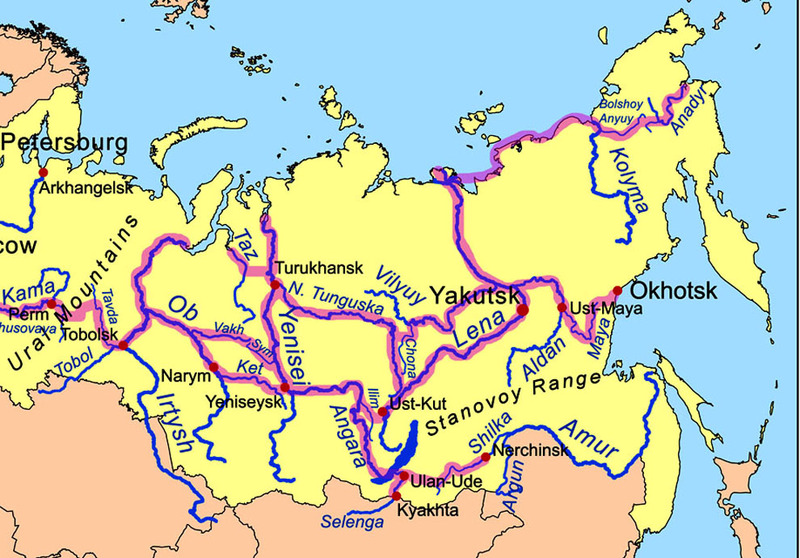 With the invasion of Russian Cossack troops at the end of the 18th century, smaller groups fled further to the north and today settle at the rivers Kolyma, Indigirka and Alazeya. These areas represent now the northernmost distribution area of the Turkic peoples. Their original life style consisted of horse breeding and nomadism. Yakut horses are well adapted to harsh winters. With the invasion of the Russians, agriculture and stockbreeding were boosted, but because of the need for grass-farming and construction of winter stables, these then became too expensive. They lived in one-room log cabins, which were provided with a roof made of soil, and were covered outside for heat insulation with dung or clay. Such a building style can still be found with stables. The culture of the Yakuts knows both, the southern steppe tradition like the processing of Kumys (mare's milk) as well as northern Taiga traditions like reindeer breeding. They constitute a self-conscious ethnic group, still there is only little Russification, and they have maintained their own language and their own tradition in literature, theatre and music.